In December my friend Sumana came to visit me. I have a longer entry to write about her, but I want to publish this one first. One night as we were hanging out at my house, she asked if we could make something together. So we got out pencils and paper and we did! 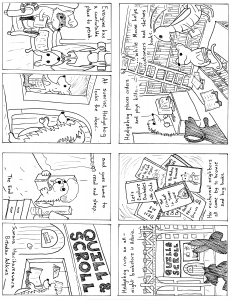 What we made was zine, a sort of companion piece to a zine she worked on with a different friend about animals who run bookstores in the Bay area. 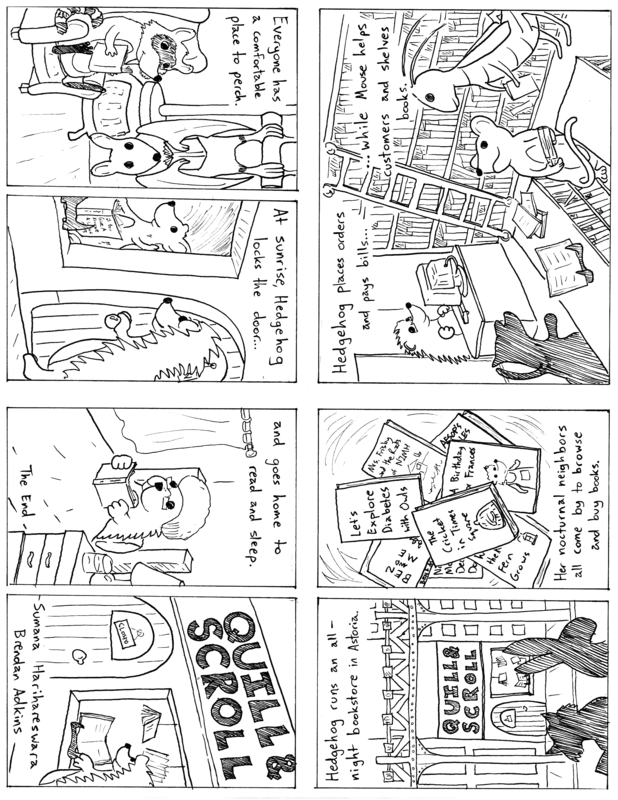 This one is about an all-night animal bookstore in Astoria. Sumana wrote it and I drew the pictures, and—I must emphasize this—it is completely adorable. You can download it and print it out yourself if you would like to. It’s in the “8-sided zine with one cut” format, no tape or staples necessary. Here is the Quill & Scroll PDF and another PDF with no margin, which may make for easier printing. And here it is as an image. This work is released under a Creative Commons Attribution 4.0 license.